The Washington Department of Transportation (WSDOT) regional office in Wenatchee recently implemented a pragmatic solution to cut costs and improve reliability on one of its communication links. Wanting to eliminate expensive monthly long distance charges associated with dial-up telephone access to its 24-hour live Internet "Traffic-Cam" and Road Weather Information Station (RWIS) at Stevens Pass, 60 miles West of Wenatchee, WSDOT began looking into alternatives in early 2000. In the Fall of 2000, finding a viable alternative became more urgent because WSDOT decided to install a new Highway Advisory Radio (HAR) at Stevens Pass. (A HAR is a Digital Message Programmer and AM Radio Transmitter for broadcasting traffic and weather conditions to motorists in the immediate area). WSDOT's goal, according to Mats Gustafsson, WSDOT Electronics Technician and ITS Coordinator, was to find an affordable and reliable way to access its Traffic-Cam, Road Weather Information System and Highway Advisory Radio. "We didn't want to rely on long distance phone lines," Mats said, "so, after several months of research, I put together a proposal that would save $400 to $600 a month on long distance charges. Additional benefits included refreshing camera images more frequently and improving overall reliability and signal quality." The proposal called for creating a direct link between Wenatchee and Stevens Pass. The plan was to use an existing microwave network between Wenatchee and Skyline Lake, then extend a communications link the 1 1/2 miles or so to the WSDOT communications site at Stevens Pass. The microwave network was already in place, but, at first glance, installing the 1 1/2 mile link between Skyline Lake and Stevens Pass initially posed serious obstacles. Steep canyons and tall pine trees made burying cable or installing line-of-sight transmission equipment difficult. Interference from frequent summer lightning storms posed a continuous threat to transmission signal quality. Mats initially considered wireless and copper, but eventually opted for fiber optic cable. Figure 1. The existing microwave network at Skyline Lake (Stevens Pass) provides a link to the WSDOT Euclid Street Communications Center in Wenatchee. The fiber multiplexer and RS-232 Telephone Extender were located at each end of the fiber link at Stevens Pass. Total cost for the four units would pay for themselves in less than two years by eliminating the long distance costs of the previous set-up. "Because of the mountainous terrain, wireless presented some inherent problems with the line of sight and getting enough speed to maintain voice quality," Mats explained. "Burying copper (cable) required obtaining right-of way permission from the Forest Service and there were concerns about lightning and signal quality." Fiber surged to the forefront when Mats discovered that the Chelan County Public Utility District (PUD) had installed a 12-strand fiber optic cable between its substation at Stevens Pass and the adjacent Microwave station at Skyline Lake. Best of all, two of the fibers were made available to WSDOT as part of a cooperative agreement with PUD. "Because we only had to install fiber 1,000 feet or so from the RWIS Building (Stevens Pass Communications site) to the Substation, it made a lot of sense," Mats said. "I also liked the immunity from signal interference that fiber provided." 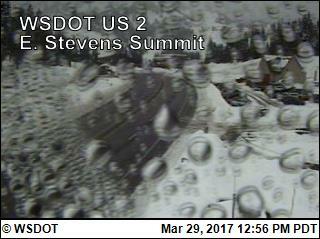 Below is the 24-hour "traffic cam" view from summit of Stevens Pass in WA. WSDOT solved its voice, data & video connectivity problem with fiber multiplexers and a unique RS-232 Telephone Extender. The fiber optic data link was easy to find, but Mats spent considerable time searching for a suitable and affordable connectivity product to extend the telephone service to Stevens Pass. This was critical to the project because it enabled signficant cost savings by keeping telephone calls "local" from Wenatchee. TC1900 RS-232 or Fiber Telephone Extender is compatible 2-wire analog PBXs. Eventually, acting on a suggestion from Chelan County PUD Engineer Mark Boersma, Mats settled on two products from fiber communications vendor TC Communications in Irvine, California. These products, an 8-channel fiber optic multiplexer with handshaking signals and a single channel telephone extender, provided data interfaces (RS-232) for the Traffic- Cam, Road Weather Information Station and a dial-up telephone interface for the Highway Advisory Radio. The Telephone Extender, which plugs into any RS-232 circuit, is compatible 2-wire analog PBXs. The fiber multiplexer and RS-232 data Telephone Extender were located at each end of the fiber link between Skyline Lake and Stevens Pass. Total cost for the four units would pay for themselves in less than two years by eliminating the long distance charges. "We looked at a couple of other hardware and software solutions, but one was overkill and the other was way too expensive," Mats said. "It was clear that TC Communications offered the most viable, affordable solution." The Traffic-Cam, which provides a 24-hour live image of the weather conditions on Stevens Pass, sits on a pole 40 feet above a sign bridge located next Highway 2. Underside close-up of mize its use and effectiveness. 24-hour Traffic Camera. Traffic-Cam images are transmitted to a server at the communications center in Wenatchee, then sent to the WSDOT office in Olympia. The image is then put out on the Internet via the WSDOT web site. (The direct web address for the WSDOT Sevens Pass Camera is http://www.wsdot.wa.gov/Traffic/passes/stevens/). "Camera images are transmitted at 5-minute to WSDOT communications centers in Wenatchee and Olympia," said Mats. "When the camera was originally connected to the web site by a long distance phone line and a 33.6K modem, images were refreshed every 30 minutes to minimize long distance phone calls." The Weather Information Station collects various weather data from adjacent sensing equipment at Stevens Pass. This data is then transmitted to WSDOT offices in Wenatchee and Olympia, and the weather department at the University of Washington. The result of a partnership between WSDOT and the Stevens Pass Ski Area, the new Highway Advisory Radio (HAR) went into operation in mid-February 2001. It broadcasts at 1610 Khz to provide motorists with immediate traffic and weather conditions in all seasons. The Weather Information Station collects various weather data from adjacent sensing equipment at Stevens Pass. A Remote Processing Unit (RPU) in the Equipment Shed collects the data from the sensors and transmits it over the fiber/microwave network. Designated WSDOT and Ski Area message coordinators call on an "as-needed" basis to program the HAR with updated weather and traffic control information. The HAR can store up to 250 different messages with a combined recording time of 14.3 minutes. According to Jeff Adamson, WSDOT Communications Manager for the North Central Region, the HAR is particularly useful during the ski season. "It enables skiers to tune in for messages on 1610 AM radio to hear which parking lots are open and which are full," Jeff said. "When leaving after a day on the slopes, it also enables skiers to tune in immediately find whether road restrictions (e.g. chain requirements) have changed from the WSDOT." According to Jeff, future considerations for the Stevens pass communications network include installing a Stationary Changeable Message Sign (SCMS). Moreover, the existing availability of at least five more communications channels off of the fiber multiplexer helps give WSDOT a variety of options for its Stevens Pass intelligent transportation system network. The Road Weather Information system on Stevens Pass is one of more than 1,000 weather gathering stations throughout Washington. Although weather data from this station is used locally, a computer server in Olympia polls it on a regular basis and it finally ends up at the Weather Center at the University of Washington in Seattle. Sensors in the immediate area measure a variety of weather data including air temperature, surface and sub-surface highway temperature, higway wetness, anti-icing chemical concentration, visibility, humidity, wind speed and direction, and barometric pressure. A Remove Processing Unit (RPU) in the Equipment Shed collects the data from the sensors and transmits it over the fiber/microwave network. The sub-surface temperature, typically measured 12” below the highway surface, measures how much “energy” is in the road. For example, high sub-surface energy could result in precipitation freezing on the highway surface even though the air temperature is above freezing. This is important information for motorists, but it also tells WSDOT personnel how much de-icing fluid is required. In addition to determining how much or how little de-icing fluid is required, this information is also used to make sure that de-icing fluid is applied during the correct “window” of weather-related variables to maxi- Underside close-up of mize its use and effectiveness. Microwave tower and communications building at Skyline Lake, 1.5 miles above Stevens Pass. Equipment inside Skyline Lake communications building. Jeff Adamson, WSDOT Communications Manager, and Mats Gustafsson, WSDOT Electronics Technician and ITS Coordinator.